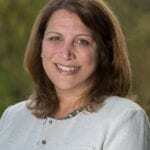 Home » Blog » Blogs » Should Families Go to the Travel & Adventure Show? 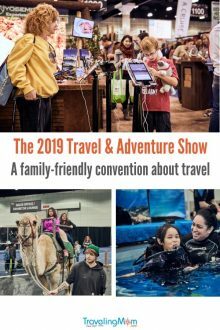 Families can get travel ideas at the nine Travel & Adventure Shows around the U.S. in 2019. Photo courtesy of Travel & Adventure Show. Every year, the Travel & Adventure Show fills convention centers around the U.S. with exhibitors representing hundreds of travel destinations. 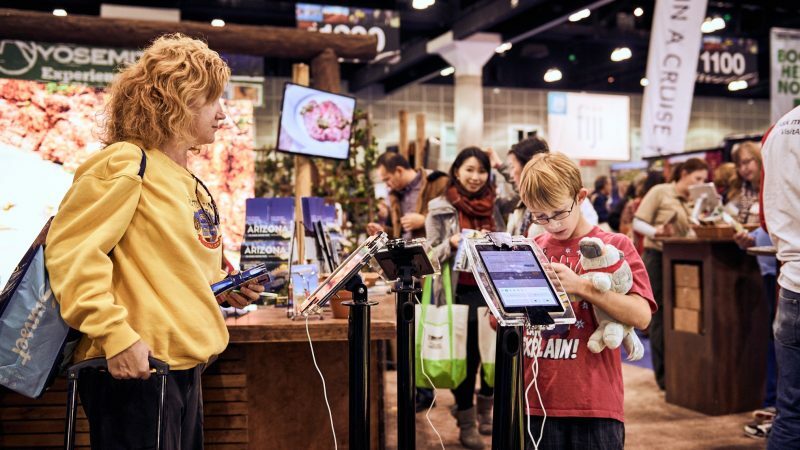 Is it worthwhile for families who like to travel to go to this convention? One TravelingMom who has attended every year for nearly a decade chimes in. 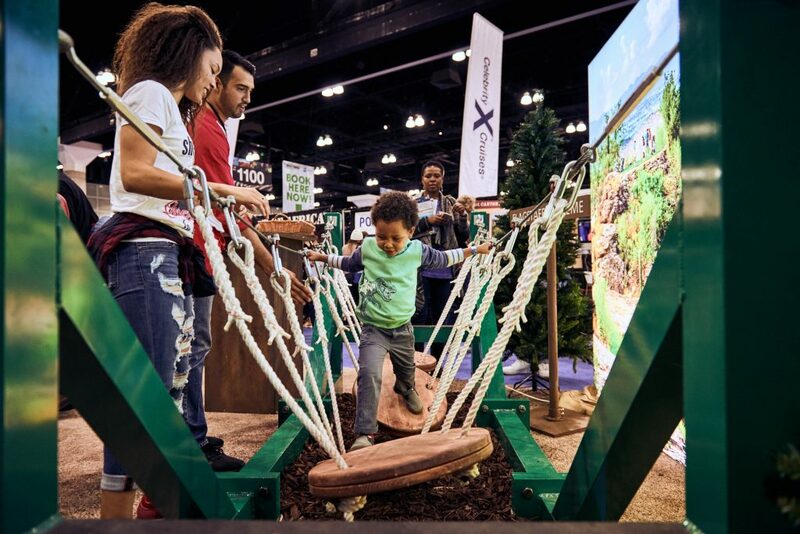 There are activities for kids at the nine Travel & Adventure Shows around the U.S. Photo courtesy of Travel & Adventure Show. Just as fans of comics and superheroes get hyped for ComicCon, I get excited for the annual Travel & Adventure Show. I’ve gone to this open-to-the-public convention every year for nearly a decade, sometimes with my mom (who is also a travel writer), and sometimes with my kids. Yes, it’s in a massive convention, which means lots of walking. And yes, it’s a crowded show swarming with travel agents and industry professionals. But even if you’re just an average Joe who loves to travel, it’s worth the trip. What I like best is that it’s fun to “shop” for vacations. I gather info on places I plan to visit, find new places to add to my bucket list, and even stop at exhibits for places I’ve already been and loved to see what’s new. This year, between January-March 2019, the Travel & Adventure Show will be in nine U.S. cities (Chicago, San Diego, Boston, Los Angeles, Denver, Philadelphia, Washington D.C., San Francisco and Dallas). Chicago’s show Jan. 12-13, 2019 will be the largest in its 15-year history this year, with more than 350 exhibitors. I spoke with the show’s COO Jim Forberg about whether it’s worthwhile for families – or at least the parents who like family travel – to go to this show. Like me, his answer was a resounding YES. Here’s why. Bring the kids – don’t cost nothin’. It’s cheap for adults, too. Adult admission is $15, but there are lots of discounts out there. If you buy in advance, you can probably find a 2-for-1 promotion or $10 tickets (see https://travelshows.com/). Also worth noting: many travel and tour companies offer special pricing for show attendees. 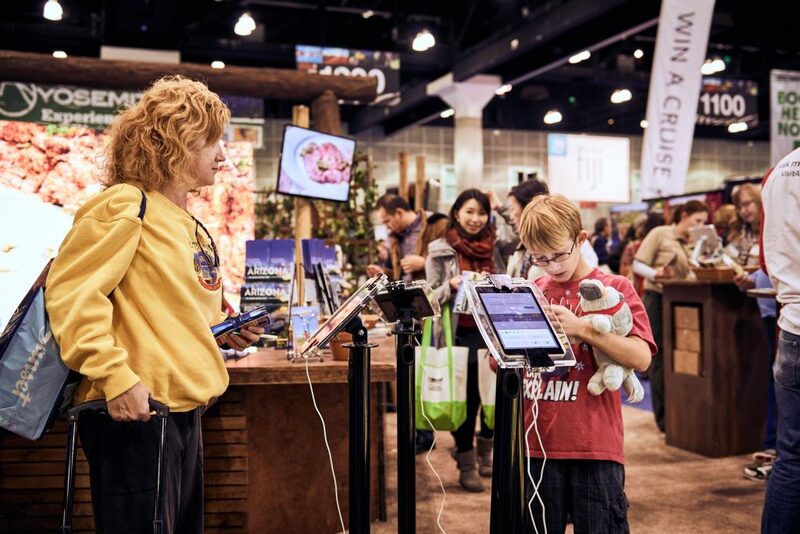 Families can get travel ideas at the nine Travel & Adventure Shows around the U.S. in 2019. Photo courtesy of Travel & Adventure Show. The alphabetized list of exhibitors begins with Africa, Arizona, Aruba … and I’ll just stop right there, because that tells the story. Every major travel destination is represented, and even some not-so-major ones, like North Dakota or Guatemala. You’ll find small river cruises, giant ship cruises, camping, cycling trips, luxurious train rides … you name it. It’s there. There are also travel-related products and services. If you think this show is only about extravagant, expensive trips, you’d be wrong. Each show designates a section for local, driving-distance vacations (I live in Chicago, so places like Joliet, Indianapolis, or Door County, Wisconsin are featured at my local show). Whether you want to spend $800 or $30,000 on your family vacation, there’s something in your price range. “People often come in thinking they want go to one destination, and come out thinking about something completely different,” Forberg said. Nothing is more valuable than travel advice from people you trust (like the TravelingMom.com bloggers!) and locals. At the Travel & Adventure Show, you can talk to people working the booths who live in the destinations they’re representing. They’re a goldmine of real, honest and valuable advice. You can say, “I have a 13-year-old and a 15-year-old. What are some things we can do?” Or “What’s a good way to save a few bucks there?” You don’t just have to pick up brochures and listen to sales pitches. Tap these local experts for their knowledge. New this year, the Chicago Passport Agency will processing U.S. passport and Global Entry acceptance applications at the show. Just bring your own passport photo. Remember that for children’s passports, both parents must be present. For details, see https://travelshows.com/shows/chicago/passport-global-entry-acceptance-program/?utm_campaign=website&utm_source=sendgrid.com&utm_medium=email. The lively show has people in native dress roaming the show floor, and stages with global-themed performances, like ethnic dancers from Mexico, Ireland and Fiji. “It’s like a mini World’s Fair,” Forberg said. Free camel rides are offered at the nine Travel & Adventure Shows around the U.S. in 2019. 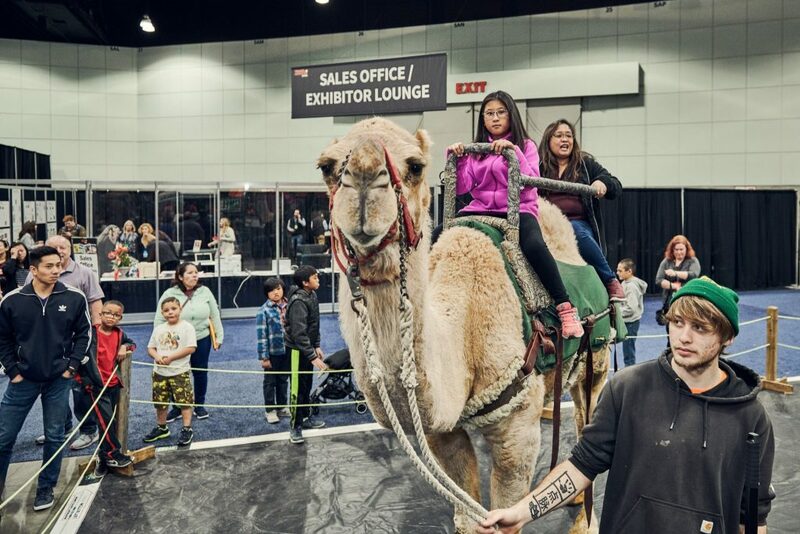 Hop onto Eli, the Travel & Adventure Show camel, and take a slow ride around the indoor ring. The camel is from a rescue center, and the group brings the camel there to promote awareness about their work. “I think the adults like it more than the kids,” Forberg said. Some of the top travel experts in the country – PBS’s Rick Steves, Travel Channel’s Samantha Brown, guide book company owner Pauline Frommer, and “1,000 Places to See Before You Die” author Patricia Schultz, will give presentations, offering travel tips and advice. “They speak to people at a level everyone can understand,” Forberg said. Free scuba diving lessons are offered as part of the Travel & Adventure Show. 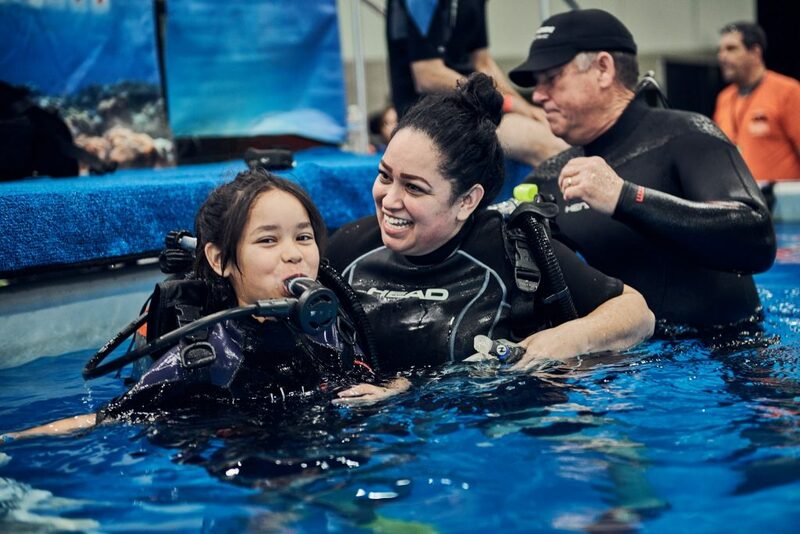 Bring your swimsuit to the show, and professional dive instructors will let adults and children experience what it’s like to scuba dive in an indoor pool. Any child 10 and older can do it, but must be with an adult if they’re under the age of 12. Afterward, you can visit booths with destinations known for great diving. Kids love to take photos of themselves, so check out the green screen booth, sponsored by the Arizona tourism office, where you can take photos of yourself at a destination like the Grand Canyon and share it on social media. Many exhibitors hand out little gifts or trinkets, or have a wheel you can spin for prizes. For more information about the show, visit TravelShows.com.